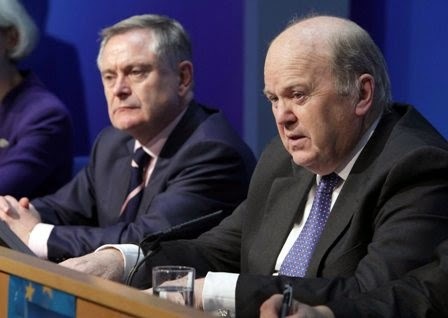 Finance Michael Noonan at a press conference on Tuesday to discuss the budget. On Tuesday in the Dail (Irish Parliament), the Minister for Finance Michael Noonan introduced his budget for the coming year, taking a further €2.5 billion out of an economy that is already on its knees. One-third of this was in tax hikes and two-thirds was in reduced government spending. This is the seventh austerity budget we have had since 2008, the cumulative effect of which has been a budgetary adjustment of over €30 billion euro. If a similar exercise were carried out on a proportional basis in the US over a similar five-year period, America's budget problem would be solved and its spiraling debt problem would be under control. That gives you some idea of the scale of the "adjustment" that has been going on here since the crash hit us in 2008. Austerity budget has become a jargon term, but what it means is actually quite simple. An austerity budget reduces the amount of state money in the country by a combination of tax hikes and state spending cuts. Here in Ireland, the aim has been to get our spending back in line with our reduced tax revenues after the crash in 2008, to get the country out of the EU-IMF bailout program which has been funding us since 2010, and to restore our economic sovereignty. It's been a tough few years and it's got harder with each passing year. The reason is that the fat in government spending was stripped away in the early years. At this stage we are down to the bone, and there are no easy choices left when it comes to cutting state spending. So what we got in yesterday's budget was some very nasty medicine, even if there was an attempt to coat it with a sprinkling of sugar. One example which immediately made the headlines was the ending of the €850 state grant to help low income families pay for a funeral; this was taken away from everyone except those in extreme poverty who are too poor to bury their dead. That headline grabber was one of dozens of small "adjustments" in state spending which are going to hit people here in the coming year. The reason the net was spread so wide was because the usual big sources of government revenue, income taxes and VAT or sales taxes, have already been pushed to the limit here. So there was no change in income tax rates in this budget. An example will show you why -- when you get to €32,800 income here you pay a rate of 52 percent on anything extra you earn. But a few miles up the road in Northern Ireland (and in the rest of the U.K.) you would have to be earning the equivalent of over €150,000 before you would hit that tax level. With the big revenue generators here at their maximum the government has been forced to look elsewhere to raise cash. So we have death by a thousand budget cuts. And a great many of these "adjustments" are aimed at old people. The perception is that old people have escaped most of the pain in the crash so far because many of them are mortgage free and have built up some savings, so the government views them as fair game. The interest you earn on savings in Ireland is hit by DIRT tax (deposit interest retention tax). This is deducted by whatever financial institution you have your savings in before they pay you your interest. It used to be 33 percent, and with this Budget it is now going up to 41 percent. And when you add the welfare levy on top of that it becomes 45 percent, so you lose almost half your interest. This a particularly nasty form of taxation because for many old folk their savings pile has been accumulated from income over the years they have already paid tax on. In addition to that, the emergency government levy on private pension funds which was introduced a couple of years ago has been extended, even though it was supposed to be a temporary measure. This reduces the value of the pension funds built up by people who have worked hard to pay for their own retirement. They were allowed to put before-tax income into these pension funds, but of course they have to pay income tax on their pensions when they get them. The DIRT move is aimed at older people sitting on cash piles at a time when the government wants more spending to stimulate job creation. But it's a shoddy way to treat old people, and we could yet see another "grey brigade" revolt by pensioners here as a result, like the demonstration a few years back when the last government tried to take away their medical cards. In this budget this government is limiting the number of over-70s who can get the medical card which gives them free medical care here. Any person over 70 who has an income of over €500 a week will no longer get a full medical card. And other allowances poorer old folk get, like the telephone allowance, are being chopped or pared back. It's not just the old who have been targeted. Also being hit are the young. Welfare for unemployed people here is €180 a week, but that was reduced to €100 a week some time ago for the 18-year-old school leavers here who can't get a job. That lower rate will now apply to everyone under 24. The government is insisting that this is to encourage younger people to find a job or go on one of the training courses. The problem is that there are not enough jobs around for young people, and there seems little doubt that one of the results of this cutback will be higher emigration among school and college leavers. And we're talking forced, not voluntary, emigration because if you don't have enough to exist on you don't have a choice. Other changes in the budget included a further hike in student fees and in drug prescription charges (these are the payments low income people have to make when they get their free medicines), and of course "the old reliables" took a bashing with another 10 cent on cigarettes and a pint and an extra 50 cent on a bottle of wine. These are on top of the already high taxes on tobacco and alcohol and are certain to add to the huge illegal tobacco trade we have here. There were several spoonfuls of sugar scattered around to make the medicine go down. The most high profile was the free doctor care for all kids under five. But this is a universal entitlement so everyone gets it, including the children from well-off families who don't need it. Meanwhile, other parts of our creaking health service are desperately short of funds. And sick old folk are losing free services. Another sweetener was the ending of the air travel tax which will be good news for people visiting here. That was just one of a number of measures aimed at job creation, in tourism and other sectors. The government is claiming it all adds up to a €700 million stimulus to kick-start the economy, which is now showing slight signs of growth. Overall, the reaction here to the budget -- unless you are part of the grey brigade -- was that it does not seem as bad as people were expecting. But that is mainly because it is something of a stealth bomber budget hitting numerous small targets. And of course next year, the property tax kicks in at the full rate and the year after we will start paying water charges. We also have at least one more austerity budget to get through, and maybe more. Any sign that we are failing to get our state finances in order again will make the markets that will have to lend to us after the departure of the IMF deeply suspicious. To reassure them and to show them we can repay interest on debt we will have to produce a modest budget surplus in the coming years. That means tight control of state spending will have to go on, unless revenue rebounds and that's not going to happen any time soon. Overall, this budget is just another stop on the track to recovery. We are near the end of the austerity line. But we're not there yet.